Until just a few years ago, the concrete walkways of London’s Southbank Centre were empty, bleak areas. Despite being part of the UK’s largest arts centre and surrounding some of London’s most iconic venues, including Royal Festival Hall, the surrounding passageways led nowhere useful for most people. But then new management realised that with a little forethought, the long passageways could become destinations in themselves. 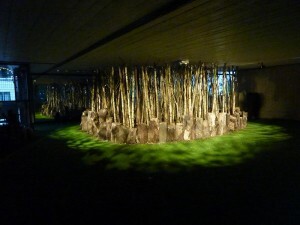 They began to commission art installations, and this year, Southbank Centre teamed up with Cornwall-based environmental education charity, the Eden Project, to create a woodland garden for the summer-long Festival of Neighbourhood with MasterCard – part of which is lit with ETC Source Four Mini luminaires. Southbank Centre’s technical manager Roger Hennigan explains: “I needed a fixture which would be able to project a powerful, focusable beam of light – using break-up gobos to give a dappled effect not only on the woodland but also on the green artificial turf. They also needed to be small: in this relatively compact space; we didn’t want them getting in the way. The Source Four Mini comes in black, white or silver as standard and has four field-angle choices– capable of surprisingly long throws. The fixture is available in a portable version, a canopy-mount design with an integral transformer, or a Eutrac adapter with integral transformer, as Hennigan used at the Southbank Centre. The Source Four Mini comes in black, white or silver-grey as standard and has four field-angle choices. It is available as a portable version, a canopy-mount design with an integral transformer or – as Hennigan used at the Southbank Centre – with an Eutrac adapter and integral transformer.